With Visual Studio 2017, Microsoft increased the release cadence for C#. 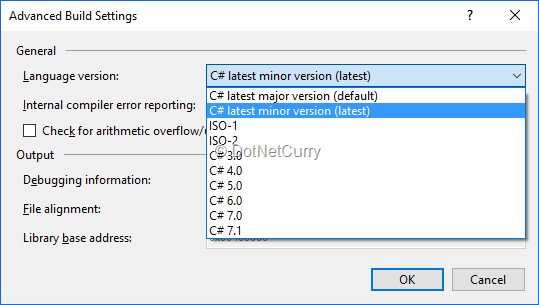 Between the major versions, which were historically aligned with new Visual Studio versions, they started to release minor versions as part of selected Visual Studio 2017 updates. Minor versions will include smaller new features, which don’t require changes to the Common Language Runtime (CLR). Larger features will still be released with major versions only. C# 7.1 was released in August 2017 as part of the 15.3 update for Visual Studio 2017. Unlike new language releases in the past, this time the new features are not automatically enabled after updating Visual Studio; neither in existing projects, nor when creating a new project. If we try to use a new language feature, the resulting build error will suggest upgrading the language version in use. The language version can be changed in the project properties. On the Build tab there is an Advanced button, which will open a dialog with a dropdown for selecting the language version. By default, the latest major version is selected, which is 7.0 at the moment. We can select a specific version instead (7.1 to get the new features) or the latest minor version, which will always automatically use the latest version currently available. The latter option is not selected by default. This is so that development teams can control how they will adopt new minor language versions. If new language features were automatically available, this would force everyone in the team to update Visual Studio as soon as a single new feature was used for the first time or the code for the project would not compile. The selected language version is saved in the project file and is not only project specific, but also configuration specific. Thus when changing the language version in the project properties, make sure you do it for each configuration, or even better: set the Configuration on the Build tab to All Configurations before applying the change. Otherwise you might end up changing the language version for Debug configuration only, causing the build to fail for Release configuration. For some language features, there is also a code fix available, which will change the language version to 7.1 or to the latest minor version. It will automatically do it for all configurations. When using one of the new signatures, asynchronous methods can be awaited directly inside the Main method. The compiler will generate the necessary boilerplate code for them to work. as the argument value when calling a method. The literal expression syntax is equivalent to the value expression syntax but is terser, especially with long type names. C# 7.1 extends type patterns to also support generic types, making the code above valid. The language development didn’t stop with the release of C# 7.1. The team is already working on the next minor version – 7.2. The release date is not yet announced and the new features cannot be tried out easily, although all the specifications and discussions around them are public. As the release approaches, we can expect that the updated compiler supporting the new features will be included in Visual Studio 2017 Preview, which can safely be installed alongside the current Visual Studio 2017 release. Several new language features are currently planned for C# 7.2, however they are still subject to change. Some of them could be postponed to a later version and new features could potentially be added as well. According to the current plans, this will become a valid method call in C# 7.2. Positional arguments will be allowed even if they follow a named argument, as long as all the named arguments are still in their correct position and the names are only used for code clarification purposes. Common Language Runtime (CLR) supports a class member accessibility level that has no equivalent in the C# language and thus cannot be used: a protectedAndInternal member can be accessed from a subclass, but only if the subclass is within the same assembly as the base class declaring the member. protected will make the member visible only to subclasses, but they could be in any assembly. There will be no restriction that they have to be placed in the same assembly. internal will restrict the visibility of the member to the same assembly, but all classes in that assembly will be able to access it, not only the subclasses of the base class declaring it. For C# 7.2, a new access modifier is planned: private protected will match the protectedAndInternal accessibility level – members will only be visible to subclasses in the same assembly. This will prove useful to library developers who will not need to choose between exposing protected members outside the library and making internal members available to all classes inside their library. In C# 7.0, support for return values and local variables by reference was introduced. 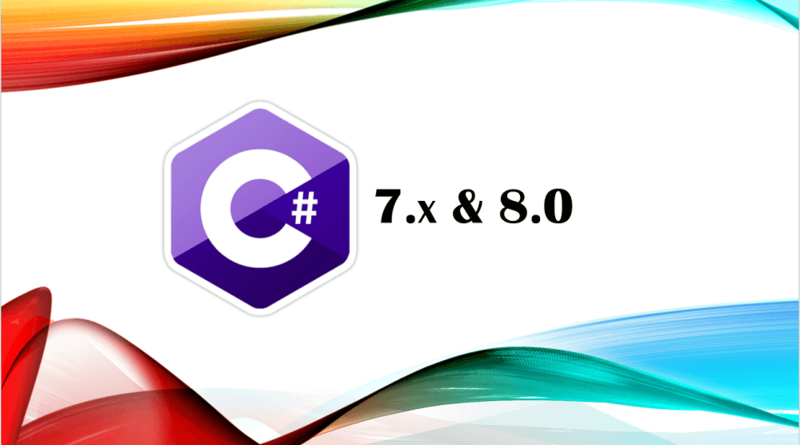 You can learn more about it from my previous article on C# 7.0 in the Dot Net Curry (DNC) magazine. 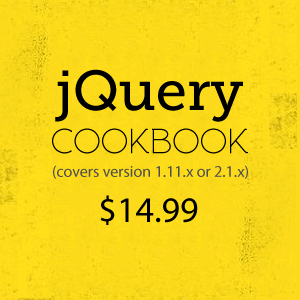 This will throw an IndexOutOfRangeException because emptyArray will still be evaluated. In performance sensitive applications, structs are often passed by reference to the called function, not because it should be able to modify the values, but to avoid copying of values. There is no way to express that in C# currently, therefore the intention can only be explained in documentation or code comments, which is purely informal and without assurance. The syntax is not yet finalized. Instead of ref readonly, in could be used. Even both syntaxes might be allowed. There is a concept of unmanaged or blittable types in the Common Language Runtime, which have the same representation in managed and unmanaged memory. This allows them to be passed between managed and unmanaged code without a conversion, making them more performant and thus very important in interoperability scenarios. In C#, structs are currently implicitly blittable if they are composed only of blittable basic types (numerical types and pointers) and other blittable structs. Since there is no way to explicitly mark them as blittable, there is no compile time protection from unintentional changes to these structs, which would make them non-blittable. Such changes can have a very large impact as any other struct including a struct that became non-blittable, will become non-blittable as well. This can break consumers without the developer being aware of it. The requirements for a struct to be declared as blittable would remain unchanged. However, such a struct would not automatically be considered blittable. To make it blittable, it would have to be explicitly marked with the blittable keyword. With this change, the compiler could warn the developer when a change to the struct would make it non-blittable, while it was still declared as blittable. It would also allow blittable keyword to be used as a constraint for generic types, allowing the implementation of generic helper functions, which require their arguments to be blittable. In parallel to the development of the next minor language version, work is also being done on the next major version. All currently planned features are large in scope and impact. They are still in an early prototype phase and likely far away from release. This feature was already considered in the early stages of C# 7.0 development, but was postponed until the next major version. Its goal is to help developers avoid unhandled NullReferenceExceptions. The problem with such a change is that it breaks existing code: it is assumed that all variables from before the change are non-nullable. To cope with that, static analysis for null safety could be disabled at the project level, as well as at the level of a referenced assembly. The developer could opt-in to the nullability checking when he is ready to deal with the resulting warnings. Still, this would be in her/his own best interest, as the warnings might reveal potential bugs in his code. First pattern matching features have been added to C# in version 7.0. There are plans to further extend the support in C# 8.0. Recursive patterns are one of the planned additions. They would allow parts of data to be matched against sub-patterns. In spite of that, there are plans to add support for default interface methods to C# 8.0, i.e. method implementations using the syntax suggested in the first example above. This would allow scenarios not supported by abstract classes. A library author could extend an existing interface with a default interface method implementation, instead of with a method declaration. This would have the benefit of not breaking existing classes, which implemented the old version of the interface. If they didn’t implement the new method, they could still use the default interface method implementation. When they wanted to change that behavior, they could override it, but no code change would be required just because the interface was extended. Since multiple inheritance is not allowed, a class can only derive from a single base abstract class. In contrast to that limitation, a class can implement multiple interfaces. If these interfaces implement default interface methods, this effectively allows classes to compose behavior from multiple different interfaces – the concept is known as trait and is already available in many programming languages. Unlike multiple inheritance, it avoids the so called diamond problem of ambiguity when a method with the same name is defined in multiple interfaces. To achieve that, C# 8.0 will require each class and interface to have a most specific override for each inherited member. When a member with the same name is inherited from multiple interfaces, one override is more specific than the other when its interface is derived from the other one. When neither interface directly or indirectly inherits from the other interface, the developer will need to specify the override he wants to use or write his own override. By doing so, he will explicitly resolve the ambiguity. C# compiler is delivering on the promise of Roslyn: faster introduction of new features thanks to a completely new codebase. At the same time, new features are not forced onto larger teams who prefer to have stricter control over the language version they are using. They can evaluate new features and decide at their own pace when they want to adopt them. In accordance to the open source model, even the state of upcoming features in future versions of the C# language is public and available for all to explore or even contribute their opinion to. It’s important to keep in mind though, that these features are still work in progress and as such they could change without warning or even be postponed to a later version.